New York City, September 11, 2001. The morning everything changed. 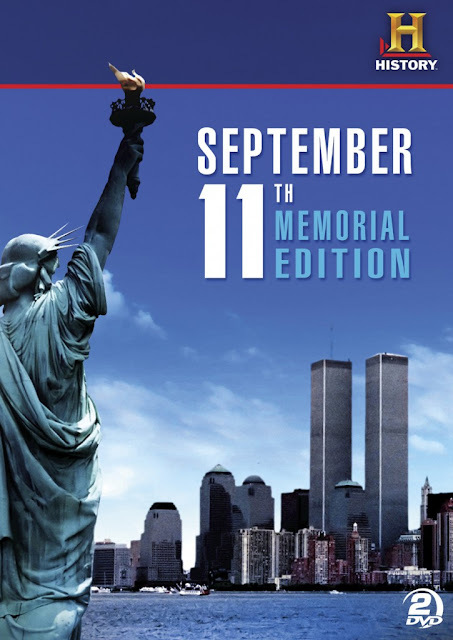 Ten years after the World Trade Center attacks, The History Channel presents the September 11th Memorial Edition, a collection of specials that document a day none of us will ever forget. Covering every aspect of 9/11 — from the events that led to the attacks, to profiles of key terrorists and political figures, to a minute-by-minute account of the attacks, to examinations of the aftermath, and the inspiring stories of the heroes that made the ultimate sacrifices — this commemorative set pays tribute to the many heroes who laid down their lives and brings sharp focus to the momentous, incomprehensible events surrounding this incomparable national tragedy. On September 11, 2001, the Islamist terrorist group known as al-Qaeda launched a coordinated attack on the United States by using four hijacked commercial airliners to crash into their intended targets which included both World Trade Center towers, the Pentagon, and most likely the Capitol if the hijackers hadn’t been thwarted by the courageous crew and passengers of Flight 93, whose fight with the hijackers for control of the plane resulted in it crashing before it could hit its target. The attacks started at 8:46 a.m. when American Airlines Flight 11 hit the North Tower of the World Trade Center. Seventeen minutes later, United Airlines Flight 175 was crashed into the South Tower. Thirty-four minutes after that, the hijackers flew American Airlines Flight 77 into the Pentagon. Twenty-eight minutes after that, United Airlines Flight 93 crashed into a field in Pennsylvania before it could hit its target after the passengers fought the hijackers for control of the plane. Nearly 3,000 people lost their lives because of the attacks. I think everyone remembers where they were and what they were doing when they first heard about these attacks. I was at work and as the horrific events continued to get worse, we were told to go home where all you could do was just watch the terrible events unfolding all the while feeling helpless to do anything to help. Watching the “102 Minutes That Changed America” documentary. It brought all those feelings back while watching the events occur all over again in a minute by minute fashion taken from hundreds of hours of footage captured by bystanders, news organizations, and more that has been compiled and assembled to make up this Emmy award winning program. Because so many people filmed what was going on, there’s a wide variety of vantage points which offer many viewpoints on the tragedy. Most of it was filmed at ground level, but we also see some high rise shots where we see people react to the second plane hitting the South Tower. We also see people talking about the unfortunate souls who fell to their death although the documentary footage shown never gets explicit. Because all of the footage is from people from a distance capturing an event, it was like watching the news programs of that time. I found the other documentaries ”Hotel Ground Zero” and ”The Miracle of Stairway B” to be far more personal and gripping since we hear how some people actually survived the the Towers collapsing on top of them. These are first hand accounts from the people who miraculously survived the attack even though there’s no way that they should have. ”Hotel Ground Zero” tells the tale of a small group of people including some firefighters who were trying to escape the Hotel Marriott which was located between and under both of the Towers and was the focal point of destruction when both Towers fell. These people had been trying to evacuate the hotel by going down the south end of the hotel when the Towers collapsed. These people would have been crushed like the rest of the hotel but were ironically saved because that part of the hotel had been reinforced after the previous terrorist attacks that took place at the World Trade Center. “The Miracle of Stairway B” is another harrowing tale of survival that involved a group of firefighters who survived the collapse of the South Tower. Knowing that many of these brave men lost their lives while trying to save people just adds even more of a emotional punch to their story. It’s nice to see that not all of them were killed that fateful day. The final documentary included in the set was “The Day The Towers Fell” which covers much of the same ground as the “102 Minutes That Changed America” documentary. Since that one covered the event minute by minute, we’ve already relived that entire disaster once and I don’t think too many people will want to do it again even if ”The Day The Towers Fell” has a much shorter run-time. I think the History Channel has done an admirable job chronicling the events of 9/11 which is good since that tragedy is something that we should never forget. I also wanted to review this so I can later show my son what happened when he is old enough to process the concept of a small group of people who are willing to murder men, women, and children to achieve thier twisted goals. It’s sad that that concept is something that everyone in the world now has to accept because of some very sick people. This full screen (1.33:1) presentation is mostly good although since the footage was taken from many different cameras under a variety of different shooting conditions, it’s very hard to make a definitive judgement. For something like this, I’m honestly not really worried about the video or audio quality, but under the circumstances that this footage was filmed in, it looks pretty damn good. Much like the video quality, the Dolby Digital stereo track offers a mix of varying quality. In some scenes, the sound is excellent while in others it’s very hard to hear what is being said. Plus, since the people who are filming these shots are there in person and reacting to what they are seeing, their voices tend to drown out a lot of what is being said or is just irritating on it’s own. The footage reveals the honest reactions of the people nearby which can be an eye-opening experience. Hearing the Towers collapse is a sound that I really didn’t want to hear again but when it’s been recorded by people that were right next to it is both sobering and terrifying especially when you consider how many people were still trapped in there. The main title of this set is the “102 Minutes That Changed America” documentary on the first disc which has been bundled with several other documentaries including ”I-Witness to 9/11″ which offers a brief talk with some of the people who filmed what happened that day and who share their experiences. The second disc has “Hotel Ground Zero,” “The Miracle of Stairway B,” and “The Day The Towers Fell,” which each run around 45 minutes each. These documentaries offer a vivid reminder of what we as a country lost after the attacks but they also show how we as a people came together. To see complete strangers helping each other and everyone showing the very best that humanity has to offer is very touching and makes one proud to be a citizen of this great country. That pride isn’t limited to just my country but also to the rest of the world as well as they made it clear with their compassionate overatures and concern. If the terrorist thought that they attacks would make America and the rest of the world cower in fear of them, they were wrong and their attacks ended up doing the complete opposite. Many people won’t have the desire to watch these cowardly attacks ever again and I don’t blame them, but for me, like it or not this is now a part of of our history and we should never forget it or the brave people who lost their lives because of a madman and his fantatics.